Won’t disrupt healing tissue by sticking to wound. Telfa™ "Ouchless" Adhesive Dressings are made of highly absorbent cotton fabric bonded on both sides with perforated, non-adherent film. Won't disrupt healing tissue by sticking to wound. 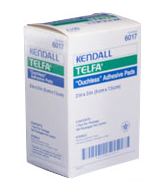 Kendall Telfa™ Ouchless Adhesive Dressing has ideal moisture vapor transmission rate that helps control fluid loss and provide moist, wound-healing environment. Perforated carton makes for easy dispensing. Adhesive strips are convenient and minimize roll up.